Earlier this week, Jane Austen became the first woman writer to be featured on a bank note in the United Kingdom. The Pride And Prejudice author joins such other literary greats as Charles Dickens and William Shakespeare, though the Austen £10 banknote is the only one currently in circulation. 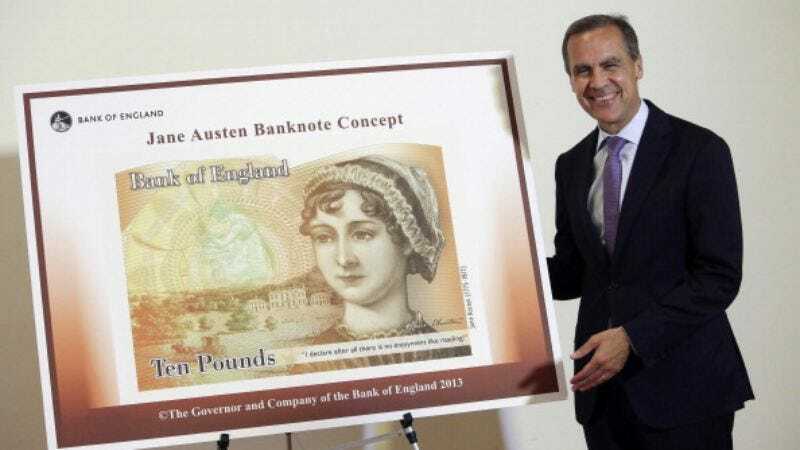 At the unveiling, which marked the 200th anniversary of Austen’s death, Bank Of England governor Mark Carney explained why she was singled out for the honor. “Austen’s novels have a universal appeal and speak as powerfully today as they did when they were first published.” And he’s absolutely right about that: the incisive commentary on gender and class oppression in her work is, among other aspects, still pertinent today. But whether or not the person who selected the quote that’s been printed on all these portrait-filled banknotes has actually read one of Austen’s most popular novels is up for debate right now. The banknote features both Austen and Elizabeth Bennet, the heroine of Pride And Prejudice and one of the most famous bookworms of all time. There’s even a quote from the 1813 novel prominently displayed under Austen’s portrait: “I declare after all there is no enjoyment like reading!” At first glance, that reads as a perfectly appropriate inscription for this particular banknote, but alas, as The Guardian notes, the quote is actually attributed to Pride And Prejudice character Caroline Bingley, who didn’t care for reading. When she utters it, she’s just trying to impress Mr. Darcy. Now some folks might argue that this gaffe isn’t such a big deal, because who could really make the distinction, and the answer is someone like Lizzie Bennet. Or—and we’re just spitballing here—Jane Austen? The Bank Of England hasn’t commented on the mix-up yet. This is the second bit of controversy over the design of the banknote—when it was first previewed, many people criticized the selected portrait, an author photo that’s been described as the “Georgian equivalent of airbrushing.” of But at least the denomination is significant, as £10 is what she was paid by Crosby & Co. in 1803 for her first novel, Northanger Abbey (though it was titled Susan at the time).